CANTON, N.Y. - The University of New Hampshire women's ice hockey team began their season Friday evening at #10 St. Lawrence where they skated to a 1-1 draw with the Saints. The UNH goal was scored by senior Devan Taylor (Billerica, Mass.) in the first period but the Saints were able to get the equalizer in the second. Sophomore goaltender Ava Boutilier (Charlottetown, Prince Edward Island) made 31 saves to preserve a tie in net and starts the season with a 0-0-1 record. Both teams will meet again Saturday, October 6 at 1 P.M. to close out the series. Location: Appleton Arena - Canton, N.Y.
- Devan Taylor started out the scoring 6:41 into the first period, assisted by the defensive pair of Marie-Jo Pelletier (Dalhousie, New Brunswick) and Tori Howran (Bancroft, Ontario) for New Hampshire's first goal of the season. - St. Lawrence responded with a goal of their own nine minutes into the second period, tying the game up. - The Wildcats held on in the third period as St. Lawrence brought the pressure, outshooting New Hampshire 10-5 in the third frame. 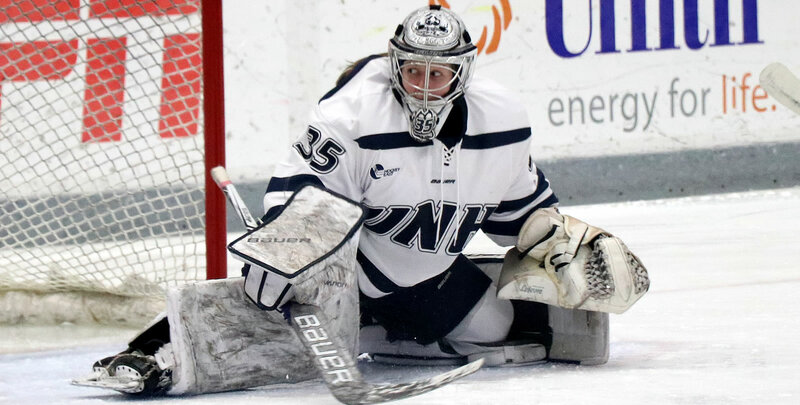 - The only penalty of the game was committed in the third period by New Hampshire; the Wildcats held off the St. Lawrence power play, which attempted two shots during the 5-on-4. - Both teams were about even in overtime on the shot chart, with St. Lawrence at three and New Hampshire at two, but neither team could get the deciding goal in the extra five minutes.